Eating and drinking is a life neccesity, but it certainly doesn't come cheap. In the UK, the average person spends £43.18 a week on food and drink. Whether you've got a large family and want to cut back, or if you're just looking for ways to be a bit more frugal with food, there are lots of ways to get free food and reduce your food bill every time you shop. It's always worth checking out what coupons are available the next time you do your weekly shop. They're a great way to reduce food costs at home while still eating the products you love. Coupons are available online to download and are normally offered directly by the company. Don't be shy to use a coupon - they're a great tool to save some money on top products and to try out new things. Keep an eye on supermarket own magazines, as these often contain coupons specific for that store. Have any of these coupons expired/do you know of a great one to add to the list? Please let us know! Another way to get free food is by applying for free giveaways. Companies such as Cadbury's, Special K, Lee Kum Kee, Green & Black's and many more have run free food giveaways in the past. They're a great way of spreading word about a brand or product - if you try it and like it, you'll be more likely to purchase it again in the future. Want a food freebie now? Score free KFC Hot Wings right now by downloading the Colonels Club App and a free Krispy Kreme Doughnut. Yum! Time limited offer! Score a FREE McDonald's burger just by downloading their app and a free Bottle of Beck Blue Beer. These normally expire very quickly, so if you spot one make sure you apply as soon as you can! Cashback apps like Shopmium and CheckoutSmart are your first stop for saving money on your food bill. Regularly updated with loads of great offers, cashback apps are there to help you save money on a range of different food and drinks. Cashback apps always have loads of great offers running at all the top supermarkets, including Tesco, Sainsbury's, ASDA and Waitrose. How complicated are these apps? Are they worth using just to save a few pounds here and there? Cashback apps are straightforward and with regular use help you make lots of savings (and try out new foods for free). These are guideline instructions - remember to follow each app's specific guidelines in order to claim your cashback. Why not download the apps now and see what savings you can make? Plus, at the moment when you sign up to Shopmium, you can score yourself a FREE Jar of Nutella using our sign-up code. How sweet is that?! If you're more of an online shopper than a supermarket sweeper, then you're in luck. Stores like Tesco and Sainsbury's regularly run offers where you use a promotional code to try out a product for free. Add the product to your basket, continue with your shop and when you're ready to checkout enter the promo code. The cost of the item will be deducted from your total, making it a freebie! It's always worth checking out what free online supermarket offers there are before you begin a shop. It may be worth staying in and ordering from the comfort of your home! Companies sometimes run their own cashback offers for their products. Next time you're out shopping, keep an eye out for packaging with a 'Try Me For Free' sticker. These mean that if you purchase the product, they'll provide means for you to claim your cashback (try the product for free). They do this to give you an incentive to buy the product, with the hope that you will like it and will want to purchase again. Companies normally run these campaigns when they bring out a new product, so it's a great way for you to test it out for free first. Make sure you keep your eyes peeled! With lots of supermarkets vying for best value for money, it can be confusing to know which is actually the cheapest. Every month, Which? releases a supermarket shop comparison revealing who came out cheapest for that month. While this does depend on your shopping list (as supermarkets will have different offers on each week), it can be useful to get a general idea of which supermarket on average comes out on top. mySupermarket is a price comparison website for supermarkets. It compares prices across all major UK supermarkets, helping you decide which supermarket is best value for your basket. Check out our handy guide on how to save money with mySupermarket. One habit from my University days that hasn't worn off is an inability to go into a supermarket without checking out the reduced sticker section. More often than not there are some amazing reductions, whether it's things you can use that day or items that can be frozen and used at a later date. If you're a meat-eater, you can often pick up meat items in the reduced section. These work great as you can freeze and then defrost when you want them! Meat is often expensive, so this is a great way to reduce your food shopping bill. We've all been there: tempted in by offers of 'Buy One Get Four Free!'. Who could say no to that?! If you regularly use (or are interested in using) the product on offer then this is a great saving - go for it! Don't be enticed in if you don't use (or even like) the product. An offer is only a good one if the item is of use to you! Companies use these marketing tactics to get you to spend your hard earned cash when you don't really need to. Always ask yourself 'do I really need this?' when shopping and you'll see your food bill reduce drastically. 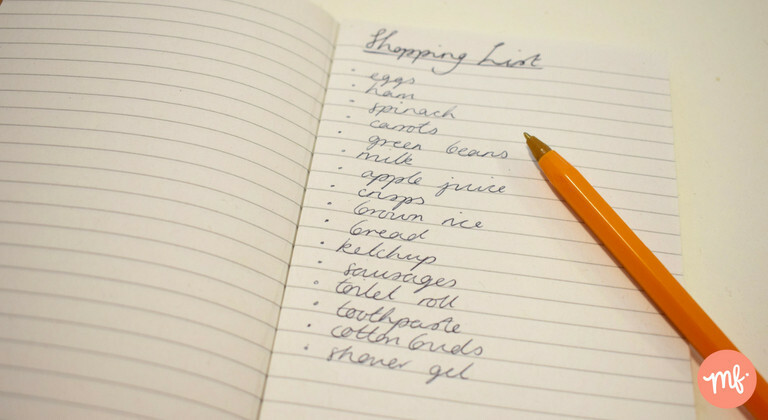 Forward plan your meals for the week and come up with a list of items that you need before you head to the shop. Not only will this stop you accidentally forgetting a key ingredient, but it'll also stop you from buying unnecessary things you don't need/already have. Did you know that supermarkets tactfully arrange their foods to get you to buy the pricer option? The more expensive products (or those with the biggest markup) tend to be at eye-level on the shelves. Make sure you look up and down to find all the best value options hidden away! Fruit and veg are often some of the priciest elements of your supermarket shop. And more often than not, they go out of date before you have the chance to eat them! Buy frozen, not fresh. A common misconception is that frozen fruit isn't as good for you as fresh. In fact, there is very little nutritional difference ('fresh' fruit could be sat in transit or in stores for days...) and frozen is normally considerably cheaper. Buy loose. If you don't think you'll eat 5 bananas in a few days, don't buy a pack of 5! Purchase your fruit and vegetables loose as and when you need them, to save money and get fresher produce. This works especially well if you live alone or have a small family. Buy wonky. ASDA, Morrisons and Lidl all sell boxes of 'wonky' fruit and vegetables. These are made up of produce that aesthetically don't make the cut, but still taste fine. So long as you're not planning on entering your fruit & veg into modelling contests you're good to go. If you go shopping before you've eaten, you'll find yourself buying the items that you want right then, not the things you need for the future. Have a snack, meal or even a big drink of water (sometimes we confuse thirst for hunger!) before you do your weekly shop to stop impulsive purchases. The simplest way to reduce your food shopping bill is to reduce the amount that you buy. If you often find that you (or the family) leave a lot on their plates after mealtimes, it is definitely worth assessing the quantity of food that you're buying. A good way to start this process is by plating up smaller portions and seeing if anyone goes for seconds. You'll be left with fresh food that you can freeze and reheat at a later date. We all like to treat ourselves to a meal out now and then, but there's no need for this to break the bank. Restaurants like Pizza Express, Prezzo, ASK Italian, Chimichanga, Zizzi and loads more regularly run offers to help you save some money and still have a delicious meal out. You can score yourself lots of fantastic deals at restaurants all across the country. Whether it's 2 for 1 on courses, money off your food bill or a freebie drink it's always worth checking out what you can get. Check out all the latest restaurant offers here. This isn't a new tip for you supermarket savvies out there, but it's worth repeating for those who don't already practice it. Supermarket own brand products are (more often than not), just as good as their branded equivalents. You're paying for the brand's name, so unless you simply can't have anything other than Yorkshire Tea (guilty) then why not try out something a bit cheaper? Even if you just swap a few products for the cheaper own-brand, you'll find yourself saving up the pennies. Remember, every little helps! When your birthday comes around, don't think about getting older - think about all the birthday freebies you can get! There are lots of free food offers available to you on your birthday, and while they won't help your everyday food bill they are definitely a nice treat. You can get a free birthday burrito at Barburrito, a free birthday main at Frankie & Benny's, a free Krispy Kreme doughnut, a free Subway cookie and free box of Hotel Chocolat chocolates. Check out the ultimate list of birthday freebies to see all the birthday free stuff you can bag. Give all these a go and you'll see yourself saving money in no time! Do you have any great ways that you save money on your food bill? Let me know! Psst - one extra tip! Sign up for the DUSK app to score a free drink every night in select bars in London or Manchester. This is fab app for some lucky savings - drinks are notoriosuly expensive in these cities!